Cosmetic ingredients are often complex mixtures from natural sources such as botanical extracts that might contain minute amounts of constituents with sensitizing potential. The sensitivity of in vitro skin sensitization test methods such as KeratinoSensTM and h-CLAT for the detection of minute amounts of sensitizer in mixtures remains unclear. In this study, we assessed the detection sensitivity of the binary test battery comprising KeratinoSensTM and h-CLAT for minute amounts of sensitizers by comparing the LLNA EC3 (estimated concentration of a substance expected to produce a stimulation index of 3) values to the minimum detection concentrations (MDCs) exceeding the positive criteria for each of the two in vitro test methods. 146 sensitizers with both sets of in vitro data and LLNA data were used. MDC values for KeratinoSensTM and h-CLAT were calculated from exposure concentrations exceeding positive criteria for each in vitro test method (EC1.5 and minimum induction thresholds, respectively). The dilution rate used to expose culture medium was also considered. For 86% of analyzed sensitizers, the in vitro test methods showed MDC values lower than LLNA EC3 values, suggesting that the binary test battery with KeratinoSensTM and h-CLAT have greater sensitivity for detection of minute amounts of sensitizer than LLNA. These results suggest the high applicability of KeratinoSensTM and h-CLAT for detecting skin sensitizing constituents present in botanical extract. Allergic contact dermatitis (ACD) is a dermatological disease resulting from the development of skin sensitization that occurs when skin sensitizing substances and products contact the skin. Since ACD frequently worsens the quality of life (QOL) of workers and consumers, skin sensitization is considered to be one of the key human health endpoints of safety assessment of the ingredients comprising cosmetics and medicine. Skin sensitizing potential has been assessed primarily using animal tests, such as the guinea pig maximization test (Magnusson and Kligman, 1969) and the murine local lymph node assay (LLNA) (Basketter et al., 2002). However, the development of non-animal test methods has been pursued due to regulatory requirements and ethical issues. Non-animal test methods for skin sensitization have been developed by focusing on the first three key events (protein binding, keratinocyte activation and dendritic cell activation) of the adverse outcome pathway (AOP) for the sensitization induction phase (OECD, 2012). The direct peptide reactivity assay (DPRA) addressing protein binding (Gerberick et al., 2004, 2007), the KeratinoSensTM addressing keratinocyte activation (Emter et al., 2010) and the human Cell Line Activation Test (h-CLAT) addressing dendritic cell activation (Ashikaga et al., 2010) have therefore been developed. These test methods have been accepted as OECD test guideline after their validation against pure chemical reagents for intra-laboratory repeatability and reproducibility, inter-laboratory transferability and reproducibility, predictive capacity (accuracy) and applicability domain (OECD, 2005; OECD, 2015, 2016a, 2016b). Furthermore, several integrated testing strategies (ITS) that use multiple test methods have been actively developed because one single test method is insufficient to cover the AOP and have high accuracy (OECD, 2016c). In the cosmetic industry, various naturally derived complex mixtures such as botanical extracts have been used. It has been reported that some botanical extracts contain skin sensitizing constituents and they might induce ACD (Kiken and Cohen, 2002; Lalko and Api, 2006). These botanical extracts have frequently been extracted and solubilized into vehicles, such as water, ethanol and 1,3-butylene glycol. Therefore, these botanical extracts mainly consist of vehicle, which does not have skin sensitizing potential, but contain extracts that might have skin sensitizing potential. For skin sensitization assessment of botanical extracts without animal testing, the strategy using non-target analytical screening techniques has been proposed (Koster et al., 2015). However, in this approach, we need to perform fractionation of mixtures and then assess skin sensitization for the individual fractions because skin sensitizers have various mechanistic applicability domains and reaction mechanics (Aptula and Roberts, 2006; Roberts et al., 2015). Therefore, non-target qualitative and qualitative screening analysis of skin sensitizing constituents in complex mixtures such as botanical extracts is often difficult and time consuming. In this study, we focused on developing skin sensitization testing strategies using non-animal test methods. However, reported non-animal ITS method are not applicable to botanical extracts containing indeterminate constituents. For example, in silico techniques are not applicable to botanical extracts containing constituents without chemical structural information, as they predict the skin sensitizing potential based on chemical structure. DPRA is also not applicable to botanical extract as the test chemical needs to be mixed at a specified molecular weight ratio with synthetic model peptides. Therefore, non-animal test methods that are applicable to constituents without chemical structural information are needed for skin sensitization testing strategies for botanical extracts. As a proof of principle for testing botanical extracts with an in vitro test method, a study using KeratinoSensTM has been reported (Andres et al., 2013). In this report, Andres et al. (2013) performed a pilot study to test whether KeratinoSensTM is able to detect sensitizing constituents in botanical extracts. They aimed to detect skin sensitizers that were artificially spiked at different doses into botanical extracts evaluated as negative by KeratinoSensTM. As a result, the sensitizing potential of moderate or weak sensitizers spiked doses at 2% of higher (Citral, Cinnamic aldehyde, and Isoeugenol) were detected. However the number of analyzed skin sensitizers was limited in this report. Further investigation is therefore needed to clarify whether non-animal test methods are able to detect various sensitizing constituents that might be present in botanical extracts. The binary test battery with KeratinoSensTM and h-CLAT was reported to be able to identify skin sensitization hazards with high sensitivity (93.4% or 94.4% compared with LLNA or human data) (Otsubo et al., 2017). Among the non-animal test methods that have been listed in the OECD test guidelines, KeratinoSensTM and h-CLAT are technically applicable to the testing of multi-constituent substances and mixtures. However, the sensitizers might not be detected if present at very low concentrations in botanical extracts. As proof of concept for testing botanical extracts with KeratinoSensTM and h-CLAT, an investigation into the detection limit (DL) of minute amounts of sensitizing constituents in botanical extracts was thus needed. When a tested botanical extract is positive in a test method, a skin sensitizer would be present in the extract at the concentration exceeding the DL in the test method. For example, if a tested botanical extract applied to the ear at 100% is positive in LLNA, it is expected that the concentration of a sensitizer in the botanical extract would exceed the EC3 value (estimated concentration of a substance expected to produce a stimulation index of 3) in LLNA (Fig. 1). However, it would be difficult to identify a skin sensitizer present in botanical extract, which is complex mixture from natural sources. In this study, based on the assumption that skin sensitizers showing positive results with in vitro test methods might be present in botanical extract, the DLs of skin sensitizers present in botanical extract were compared between LLNA and in vitro test methods (KeratinoSensTM and h-CLAT). The 146 sensitizers showing positive results with KeratinoSensTM and h-CLAT were assumed as potential constituents present in botanical extracts. Furthermore, we assumed that botanical extracts are water-soluble and non-cytotoxic, and that they do not show any general masking effect on the DLs of any skin sensitizers present. We then performed a pilot study in order to test whether botanical extracts would show masking effect on the DLs of skin sensitizers for h-CLAT. The expected result in LLNA based on the concentration of a sensitizer present in botanical extract. (a) If the concentration of a sensitizer in the botanical extract is below the EC3 value, the botanical extract is expected to be negative in LLNA. (b) If the concentration of a sensitizer in the botanical extract exceeds the EC3 value, the botanical extract is expected to be positive in LLNA. Compilation of the currently available data was initially based on the published dataset (Urbisch et al., 2015; Takenouchi et al., 2015), and then 22 chemicals were added from datasets in different studies (Jaworska et al., 2015). Moreover, unpublished results for h-CLAT were used for 3-Methyl-1-phenylpyrazolone. From this dataset, a total of 147 chemicals with original references that had already been evaluated and were positive on LLNA and binary test battery were selected. Benzo(a)pyrene was excluded from the dataset because its EC3 value came from extrapolation with a high stimulation index (> 15) and it might be unreliable (Kern et al., 2010). Thus, a total of 146 chemicals were analyzed (Supplemental Table 1) in this study. In the dataset of 146 chemicals, 116 and 129 chemicals were evaluated as positive by KeratinoSensTM and h-CLAT, respectively. KeratinoSensTM addresses keratinocyte activation by measuring activation of the keap1-Nrf2-ARE pathway (Emter et al., 2010). KeratinoSensTM is a reporter cell-based assay measuring luciferase gene induction as an indicator of ARE activation in HaCaT. Cells were incubated with test chemical for 48 hr, and then luciferase induction was measured by luminometer. Test chemicals were classified as positive if luciferase gene induction showed a statistically significant increase greater than 1.5-fold over the vehicle control with cell viability > 70%. The estimated concentration of 1.5-fold luciferase induction (EC1.5) was calculated by linear interpolation. KeratinoSensTM is technically applicable to the testing of multi-constituent substances and mixtures. h-CLAT addresses dendritic cell activation. Dendritic cells are known to up-regulate the expression of CD86 and CD54 cell surface proteins following exposure to sensitizers. h-CLAT is measures CD86 and CD54 expression on THP-1 cells that serve as a dendritic cell surrogate (Ashikaga et al., 2006, 2010; Sakaguchi et al., 2006). Cells were treated with a test chemical for 24 hr at concentrations based on predetermined CV75 (concentration yielding 75% cell viability) and stained with fluorescence-labeled antibodies for CD86 or CD54. Changes in CD86 and CD54 expression induced by the test chemical are then measured by flow cytometry. Relative fluorescence intensity (RFI) to vehicle control was measured by flow cytometry. When CD86 RFI is equal to or greater than 150% or CD54 RFI is equal to or greater than 200%, the test chemical is classified as positive. The estimated concentration inducing 150% of CD86 RFI and/or 200% of CD54 RFI (EC150 or EC200) is calculated, similarly to EC3 value determination in the LLNA. The lower EC value is chosen as the minimal induction threshold (MIT). h-CLAT is technically applicable to the testing of multi-constituent substances and mixtures. DLs of skin sensitizers present in botanical extracts were calculated from exposure concentrations exceeding the positive criteria for each test method, which are the EC3 values of LLNA, EC1.5 of KeratinoSensTM, and MIT of h-CLAT (Table 1). DLs were calculated on the assumption that botanical extracts showed no masking or boosting effect to the DLs of skin sensitizers in these test methods. We did not have the LLNA data for botanical extracts containing certain skin sensitizers, but considering that the LLNA EC3 values are the concentrations of skin sensitizers expected to produce a stimulation index of 3, we would not expect to be able to detect levels below EC3(%) in a botanical extract if it was applied to the ear at 100%. Most botanical extracts would be applicable to the ear at 100% in LLNA because botanical extracts have frequently been extracted and solubilized into vehicles such as water, ethanol and 1,3-butylene glycol. Therefore DLs of skin sensitizers assuming to be present in botanical extracts for LLNA were able to be calculated as EC3 values. For KeratinoSensTM and h-CLAT, dilution of tested botanical extracts by medium was necessary. For non-cytotoxic botanical extracts with no defined molecular weight, serial dilutions from maximum concentration of 400 μg/mL are prepared for KeratinoSensTM in order to obtain the desired final concentrations of the test chemicals. Finally, botanical extracts were diluted by a factor of 2500 to be tested. Thus DLs of skin sensitizer could be calculated as EC1.5 x 2500 μg/mL. After unit conversion (μg/mL to 10-4%), the detection concentration of KeratinoSensTM (DCK) was defined as the DL of skin sensitizer. Likewise, for h-CLAT, serial dilutions from maximum concentration of 5000 μg/mL were prepared. Botanical extracts were diluted by a factor of 200 to be tested. Thus, the detection concentration of h-CLAT (DCh) was defined as the DL of skin sensitizer. The lower value of DCK and DCh was defined as the minimal detection concentration (MDC) for the DL of the binary test battery. Table 1. DLs of skin sensitizers calculated from estimated concentrations exceeding positive criteria for each test method (EC3, EC1.5, and MIT). For non-cytotoxic botanical extracts, there was no general masking effect (i.e., botanical extracts do not significantly affect the EC1.5 values of spiked sensitizers) in the pilot study using KeratinoSensTM (Andres et al., 2013). In this study, we performed a pilot study for h-CLAT in order to investigate whether botanical extract significantly affects the EC150 or EC200 values of sensitizer in botanical extracts. We used two botanical extracts, Extract A (2% of active botanical content, solubilized in 80% ethanol) and Extract B (0.5% of active botanical content, solubilized in 50% 1,3-butylene glycol). Ethanol and 1,3-butylene glycol have frequently been used as the vehicle of botanical extracts. Skin sensitizers were tested with or without botanical extracts at 5000 μg/mL, which is the maximum concentration for the h-CLAT. The detection concentration of skin sensitizers was compared with or without botanical extracts. If 5000 μg/mL botanical extract did not affect the detection concentration of spiked skin sensitizers, this suggests that there is no general masking or boosting effect by botanical extracts. In this pilot study, we used two skin sensitizers, cinnamic aldehyde and citral. It is known that cinnamic aldehyde is potentially present in Cinnamomum Camphora (Camphor) Bark Oil and citral is potentially present in Litsea cubeba or Lemongrass oil. DLs of skin sensitizers were compared between LLNA and KeratinoSensTM. EC3 values (DLs for the LLNA) and DCK values (DLs for KeratinoSensTM) were plotted in Fig. 2 (a). DCK values were lower than EC3 values for 88 of 116 analyzed sensitizers. This suggests that 76% (88/116) of sensitizers could be detected by KeratinoSensTM at lower concentrations than LLNA (Table 2). Likewise, DLs of skin sensitizers were compared between LLNA and h-CLAT. EC3 values and DCh values (DLs for h-CLAT) were plotted in Fig. 2 (b). DCh values were lower than EC3 values for 105 of 129 analyzed sensitizers. This suggests that 81% (105/129) of sensitizers could be detected by h-CLAT at lower concentrations than LLNA (Table 2). DLs of skin sensitizers were compared between LLNA and in vitro test method. (a) EC3 values and DCK values were plotted for 116 analyzed sensitizers. The dot-line suggests that EC3 values were equal to DCK values. Sensitizers that showed higher DCK values than EC3 values were plotted above the dot-line and sensitizers that showed lower DCK values than EC3 values were plotted below the dot-line. (b) EC3 values and DCh values were plotted for 129 analyzed sensitizers. The dot-line suggests that EC3 values were equal to DCh values. Sensitizers that showed higher DCh values than EC3 values were plotted above the dot-line and sensitizers that showed lower DCh values than EC3 values were plotted below the dot-line. (c) EC3 values and MDC values were plotted for 146 analyzed sensitizers. The dot-line suggests that EC3 values were equal to MDC values. Sensitizers that showed higher MDC values than EC3 values were plotted above the dot-line and sensitizers that showed lower MDC values than EC3 values were plotted below the dot-line. Table 2. Ratio of sensitizers that showed lower DLs for in vitro test method than EC3 values in analyzed sensitizers. DLs of skin sensitizers were also compared between LLNA and the binary test battery. LLNA EC3 values and MDC values (DLs for binary test battery) were plotted in Fig. 2 (c). MDC values were lower than EC3 values for 125 of 146 analyzed sensitizers. This suggests that 86% (125/146) of sensitizers could be detected by the binary test battery at lower concentrations than LLNA. When compared to KeratinoSensTM or h-CLAT alone, the binary test battery was able to detect more sensitizers at lower concentrations than LLNA (Table 2). On the other hand, 21 sensitizers showed higher MDC values in the binary test battery than LLNA EC3 values (Table 3). Table 3. Twenty one sensitizers that showed higher MDC values than LLNA EC3 values. Cinnamic aldehyde and citral were tested with or without Extract A at 5000 μg/mL, which is the maximum concentration for h-CLAT. The detection concentrations of these skin sensitizers were compared with or without botanical extract. For each skin sensitizer, EC150 values were similar with or without Extract A (Table 4 (a)), and EC200 values were similar with or without Extract A. For EC150 or EC200 without botanical extracts, historical data (Otsubo et al., 2017) were used. In addition, cinnamic aldehyde and citral were tested with or without the Extract B at 5000 μg/mL. EC150 or EC200 values were similar with or without Extract B (Table 4 (b)). 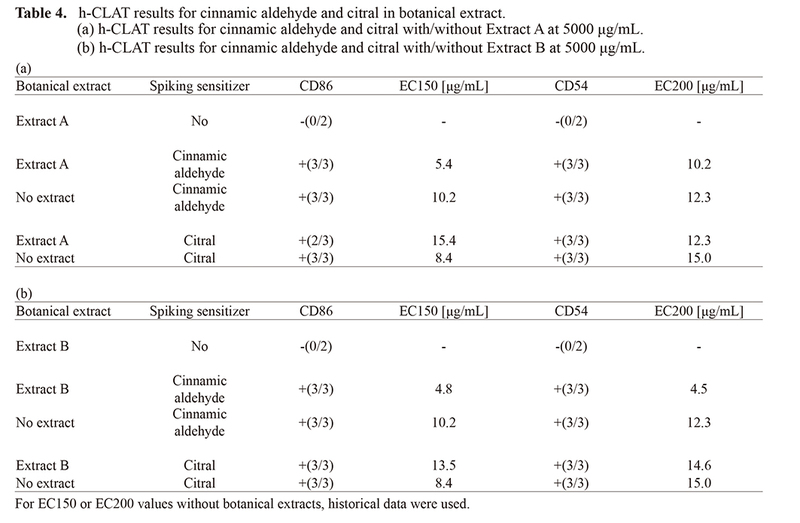 Table 4. h-CLAT results for cinnamic aldehyde and citral in botanical extract. This study aimed to clarify the applicability of in vitro test methods (KeratinoSensTM and h-CLAT) for detecting skin sensitizing constituents present in botanical extracts. It would be difficult to identify skin sensitizers assumed to be present at very low concentrations in botanical extracts, which are complex mixtures from natural sources. In this study, the DLs of skin sensitizers assumed to be present in botanical extracts were compared between LLNA and in vitro test methods using the dataset of 146 sensitizers that had already been evaluated by LLNA, KeratinoSensTM and h-CLAT. The 146 sensitizers were assumed as indeterminate constituents present in botanical extracts. The sensitivity of detecting minor sensitizers present in botanical extracts were compared between LLNA and in vitro test methods. We assumed that botanical extracts were water-soluble and non-cytotoxic, and that botanical extracts showed no general masking effect on the DLs of skin sensitizers in botanical extracts. We also performed a pilot study to test whether botanical extracts showed masking effects on DLs of skin sensitizers for h-CLAT. When a tested botanical extract is positive using a test method, the concentration of a skin sensitizer in a tested extract needs to exceed the DL for the test method. Therefore, DLs of skin sensitizers were calculated from exposure concentrations exceeding positive criteria for each test method, which were EC3 values in LLNA, EC1.5 values in KeratinoSensTM, and MIT in h-CLAT. The DLs of skin sensitizers were compared between LLNA and in vitro test methods (KeratinoSensTM, h-CLAT and binary test battery). For 76% and 81% of analyzed sensitizers, DLs were lower than the LLNA for KeratinoSensTM and h-CLAT, respectively. For 86% of analyzed sensitizers, the binary test battery showed that MDC values (DLs for binary test battery) were lower than the DLs for LLNA. This indicates that the binary test battery of KeratinoSensTM and h-CLAT has higher sensitivity for the detection of minor sensitizing constituents in botanical extracts when compared to LLNA. The binary test battery also showed higher sensitivity when compared to KeratinoSensTM or h-CLAT alone. This suggests that KeratinoSensTM or h-CLAT could cover for each other by using the binary test battery, and showed higher sensitivity than the single test method in terms of both hazard identification and detection of minor sensitizing constituents in botanical extracts. We performed a pilot study for h-CLAT to investigate whether the EC values of sensitizers, cinnamic aldehyde and citral, can be affected when intentionally added into botanical extracts. The botanical extracts even at 5000 μg/mL are negative in h-CLAT and did not significantly affect the EC150 or EC200 values of cinnamic aldehyde and citral. This suggests that there would be no general masking effect in botanical extracts. No general masking effect was also observed in the pilot study using KeratinoSensTM (Andres et al., 2013). Therefore, based on the assumption that botanical extracts did not significantly affect the DLs in KeratinoSensTM and h-CLAT, the DLs of skin sensitizer assumed to be present in botanical extracts could be calculated from EC1.5 and MIT. This study suggests that DLs for the in vitro test methods were lower than those for LLNA. For LLNA, tested chemicals would penetrate into ear skin through stratum corneum and be exposed to dermal cells. On the other hand, for in vitro test methods, tested chemicals would be directly exposed to cells. This difference in exposure process may be one of the reasons for lower DLs for in vitro test methods. However, there were some sensitizers that showed higher DLs for in vitro test methods than LLNA. In fact, 21 of 146 analyzed sensitizers showed higher MDC values in the binary test battery than LLNA EC3 values (Table 3). Hexyl salicylate was positive in LLNA, but this was probably a false positive, as confirmed by the Human Repeat Insult Patch Test (HRIPT) and Human Maximization Test (HMT) results (no induction at 35,433 μg/cm2 in HRIPT and no induction at 20,654 μg/cm2 in HMT) found in the database of the Research Institute for Fragrance Materials (RIFM) (Urbisch et al., 2015). Maleic anhydride is susceptible to hydrolysis in aqueous solution. Therefore, this chemical may need to be tested at apparently higher concentrations to identify its sensitizing potential in the cell culture system, which would lead to a higher MDC in in vitro test methods. Chlorothalonil, Tetrachlorosalicylanilide, 1-Iodohexadecane are lipophilic with Log Kow > 3.5. In KeratinoSensTM and h-CLAT, lipophilic chemicals tend to produce false negative results and negative results with test chemicals with high Log Kow should not be considered (OECD, 2016a, 2016b). KeratinoSensTM and h-CLAT correctly identified as a skin sensitizer for these sensitizers. However these sensitizers may also need to be tested at apparently higher concentrations due to unstable soluble state in aqueous solution, which would lead to higher MDC values in in vitro test methods. In addition to these 3 sensitizers, diphenylcyclopropenone also had a relatively high Log Kow (= 3.25). Thus, it was possible that diphenylcyclopropenone showed high MDC values due to the aqueous nature of the cell culture system. MCI/MI, propyl gallate, chloramine T, Anisyl Alcohol and Dihydroeugenol were putative pre-/pro-hapten (Jaworska et al., 2015). Pre-haptens need to be abiotically (through autoxidation) activated to act as sensitizers before coming into contact with the skin or on the skin itself. Pro-haptens need to be metabolically activated to act as sensitizers within the skin. It is possible that these putative pre-/pro-haptens showed high MDC values due to the limited abiotic and/or enzymatic activation of the cell culture system. It has been noted that the in vitro test methods may have limitations in detecting the sensitizing potential of chemicals that are susceptible to hydrolysis, lipophilic or putative pre-/pro-haptens (Urbisch et al., 2015). For sensitizers whose MDC(%) was higher than EC3(%), if the concentration in tested botanical extract is ≥ EC3(%) and <MDC(%), the botanical extract may give a false negative result on the binary test battery versus LLNA. To evaluate botanical extracts using KeratinoSensTM and h-CLAT, and formulate into a final cosmetic product, we need to consider the risk that tested botanical extracts might contain these sensitizers. We assumed three preconditions for the investigation in this study. First, we used 146 chemicals showing positive results with LLNA and in vitro test methods as skin sensitizers based on the assumption that these analyzed chemicals might be present in botanical extracts. As described above, it would be difficult to identify skin sensitizers assumed to be present at very low concentrations in botanical extracts. Thus, we conservatively took into account the possibility of indeterminate sensitizers being present in botanical extracts, and analyzed the DLs for the dataset of 146 chemicals. Second, we assumed that botanical extracts were water-soluble and non-cytotoxic because botanical extracts have frequently been extracted and solubilized into vehicles such as water, ethanol and 1,3-butylene glycol. Therefore, this assumption would be applicable to many botanical extracts with the exception of oil-based vehicles, such as essential oils or cytotoxic extracts. Third, we assumed that botanical extracts showed no general masking effect on the DLs of skin sensitizers present in botanical extract. Botanical extracts did not significantly affect the DL of sensitizers present in botanical extracts in the pilot study for KeratinoSensTM and h-CLAT. On the other hand, whether botanical extracts affect the DLs of sensitizers in LLNA has not been investigated. There has been no specific report on significant effect to detect sensitizers present in botanical extract in LLNA; thus, in this study we assumed that botanical extract showed no general effect on EC3 values of skin sensitizers assumed to be present in botanical extracts. If a significant effect on EC3 value of certain skin sensitizers present in botanical extracts is expected, the methods in this study should be carefully performed. This study gave a proof of principle for the sensitivity of detecting minor sensitizers present in botanical extracts without considering the variability of EC3, EC1.5, and MIT values. For LLNA, Dumont et al. (2016) analyzed the variability of LLNA for a set of chemicals for which multiple studies are available and reported the importance of considering the variability of reference data. Thus, further investigation on the variability of EC3, EC1.5, and MIT values might be needed. In this study, we assessed the applicability of in vitro test methods for botanical extracts by comparison of the DLs of sensitizers between in vitro test methods and LLNA. The results suggested the high applicability of KeratinoSensTM and h-CLAT for detecting skin sensitizing constituents present in botanical extracts. On the other hand, it should be noted that there are limitations to apply in vitro test methods exist for oil-based or cytotoxic botanical extracts. In addition, some sensitizers showed higher DLs on in vitro test methods than LLNA, suggesting that the botanical extract with the sensitizer might be positive in LLNA but negative in the binary test battery. Further evaluation such as a risk assessment strategy would be needed to minimize uncertainty resulted from less sensitivity for detecting these particular sensitizers. Andres, E., Sá-Rocha, V.M., Barrichello, C., Haupt, T., Ellis, G. and Natsch, A. 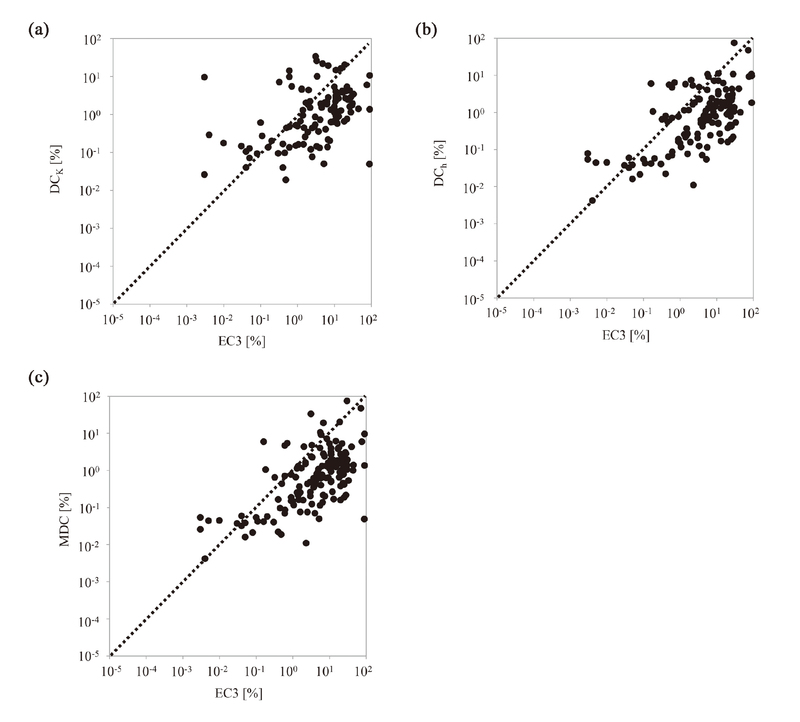 (2013): The sensitivity of the KeratinoSens™ assay to evaluate plant extracts: a pilot study. Toxicol. In Vitro, 27, 1220-1225. Antignac, E., Nohynek, G.J., Re, T., Clouzeau, J. and Toutain, H. (2011): Safety of botanical ingredients in personal care products/cosmetics. Food Chem. Toxicol., 49, 324-341. Aptula, A.O. and Roberts, D.W. (2006): Mechanistic applicability domains for nonanimal-based prediction of toxicological end points: general principles and application to reactive toxicity. Chem. Res. Toxicol., 19, 1097-1105. Ashikaga, T., Sakaguchi, H., Sono, S., Kosaka, N., Ishikawa, M., Nukada, Y., Miyazawa, M., Ito, Y., Nishiyama, N. and Itagaki, H. (2010): A comparative evaluation of in vitro skin sensitisation tests: the human cell-line activation test (h-CLAT) versus the local lymph node assay (LLNA). Altern. Lab. Anim., 38, 275-284. Ashikaga, T., Yoshida, Y., Hirota, M., Yoneyama, K., Itagaki, H., Sakaguchi, H., Miyazawa, M., Ito, Y., Suzuki, H. and Toyoda, H. (2006): Development of an in vitro skin sensitization test using human cell lines: the human Cell Line Activation Test (h-CLAT). I. Optimization of the h-CLAT protocol. Toxicol. In Vitro, 20, 767-773. Basketter, D.A., Evans, P., Fielder, R.J., Gerberick, G.F., Dearman, R.J. and Kimber, I. (2002): Local lymph node assay - validation, conduct and use in practice. Food Chem. Toxicol., 40, 593-598. Dumont, C., Barroso, J., Matys, I., Worth, A. and Casati, S. (2016): Analysis of the Local Lymph Node Assay (LLNA) variability for assessing the prediction of skin sensitisation potential and potency of chemicals with non-animal approaches. Toxicol. In Vitro, 34, 220-228. Emter, R., Ellis, G. and Natsch, A. (2010): Performance of a novel keratinocyte-based reporter cell line to screen skin sensitizers in vitro. Toxicol. Appl. Pharmacol., 245, 281-290. Gerberick, G.F., Vassallo, J.D., Bailey, R.E., Chaney, J.G., Morrall, S.W. and Lepoittevin, J.P. (2004): Development of a peptide reactivity assay for screening contact allergens. Toxicol. Sci., 81, 332-343. Gerberick, G.F., Vassallo, J.D., Foertsch, L.M., Price, B.B., Chaney, J.G. and Lepoittevin, J.P. (2007): Quantification of chemical peptide reactivity for screening contact allergens: a classification tree model approach. Toxicol. Sci., 97, 417-427. Jaworska, J.S., Natsch, A., Ryan, C., Strickland, J., Ashikaga, T. and Miyazawa, M. (2015): Bayesian integrated testing strategy (ITS) for skin sensitization potency assessment: a decision support system for quantitative weight of evidence and adaptive testing strategy. Arch. Toxicol., 89, 2355-2383. Kern, P.S., Gerberick, G.F., Ryan, C.A., Kimber, I., Aptula, A. and Basketter, D.A. (2010): Local lymph node data for the evaluation of skin sensitization alternatives: a second compilation. Dermatitis, 21, 8-32. Koster, S., Leeman, W., Verheij, E., Dutman, E., van Stee, L., Nielsen, L.M., Ronsmans, S., Noteborn, H. and Krul, L. (2015): A novel safety assessment strategy applied to non-selective extracts. Food Chem. Toxicol., 80, 163-181. Lalko, J. and Api, A.M. (2006): Investigation of the dermal sensitization potential of various essential oils in the local lymph node assay. Food Chem. Toxicol., 44, 739-746. Magnusson, B. and Kligman, A.M. (1969): The identification of contact allergens by animal assay. The guinea pig maximization test. J. Invest. Dermatol., 52, 268-276. Kiken, D.A. and Cohen, D.E. (2002): Contact dermatitis to botanical extracts. Am. J. Contact Dermat., 13, 148-152. Otsubo, Y., Nishijo, T., Miyazawa, M., Saito, K., Mizumachi, H. and Sakaguchi, H. (2017): Binary test battery with KeratinoSens™ and h-CLAT as part of a bottom-up approach for skin sensitization hazard prediction. Regul. Toxicol. Pharmacol., 88, 118-124. Roberts, D.W., Api, A.M., Safford, R.J. and Lalko, J.F. (2015): Principles for identification of High Potency Category Chemicals for which the Dermal Sensitisation Threshold (DST) approach should not be applied. Regul. Toxicol. Pharmacol., 72, 683-693. Takenouchi, O., Fukui, S., Okamoto, K., Kurotani, S., Imai, N., Fujishiro, M., Kyotani, D., Kato, Y., Kasahara, T., Fujita, M., Toyoda, A., Sekiya, D., Watanabe, S., Seto, H., Hirota, M., Ashikaga, T. and Miyazawa, M. (2015): Test battery with the human cell line activation test, direct peptide reactivity assay and DEREK based on a 139 chemical data set for predicting skin sensitizing potential and potency of chemicals. J. Appl. Toxicol., 35, 1318-1332. Urbisch, D., Mehling, A., Guth, K., Ramirez, T., Honarvar, N., Kolle, S., Landsiedel, R., Jaworska, J., Kern, P.S., Gerberick, F., Natsch, A., Emter, R., Ashikaga, T., Miyazawa, M. and Sakaguchi, H. (2015): Assessing skin sensitization hazard in mice and men using non-animal test methods. Regul. Toxicol. Pharmacol., 71, 337-351.